The tournament middlegame was very productive. The participants adapted successfully, and the spectators can sit back and enjoy. I will try covering all the exciting games, although it will be rather difficult, as there is more than enough material. The rounds 4-6 were rich on theoretical innovations. Let us start with the Caro Kann. In this traditionally solid opening White demonstrated fresh ideas in unfashionable lines. Vladimir Malakhov showed an improvement and punished his opponent for poorly prepared central activity. 1.e4 c6 2.d4 d5 3.e5 Ґf5 4.¤d2 e6 5.¤b3. Solid Caro Kann fortifications force White seeking new ways. 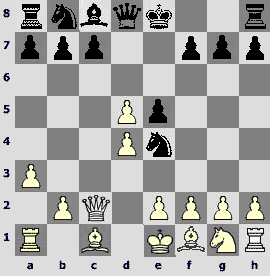 The idea of placing the knight on b3 attracted many strong chess player. It is not the first time Malakhov plays like that. 5...¤d7 6.¤f3 ¤e7 7.Ґe2 f6?! Such concrete approach was proved too risky by this game. More common and much safer is a thematic 7...h6. 9.¤h4!N. An accurate reply! In Groszpeter-Stohl (Austria 2000) White failed to achieve anything real after 9.Ґf4 ¤g6 10.Ґg3 Ґe7 11.¤h4 ¤xh4 12.Ґxh4 Јc7 13.Ґg3 Ґd6=. 9...Ґg6 10.Ґg4! e5?! This was hardly planned, but Black`s choice is limited. If 10...f5, then after 11.Ґe2 Black`s pawn structure is ruined. However, this would have been more cautious than 10...e5. 11.dxe5 fxe5 12.Ґg5 Ґg7 13.O-O. White has almost complete his development, while Black`s king will never find a safe harbor. 13...¦f8. Too bad is 13...0-0? 14.¤xg6 hxg6 15.Ґe6+ ўh7 16.Јg4ќ. 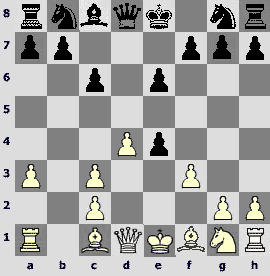 With the text-move Black prepares Ґf6. 14.Јe2 e4 15.¤xg6 hxg6 16.c4. It is time to open the central files. 16...Ґf6 17.Ґh6 ¦h8 18.Ґf4 ¤e5 19.cxd5 Јxd5? More tenacious is 19...cxd5 20.¦ac1 ўf7. 20.¦ad1 ¤d3. 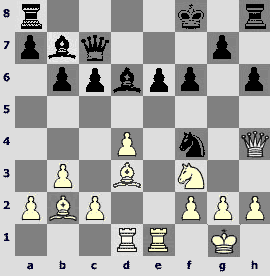 Black could extend his resistance by 20...Јc4 21.Јxc4 ¤xc4 22.¦fe1! ¤xb2 (22...¦d8 23.¦xd8+ ўxd8 24.¦xe4 ¤xb2 25.¤a5! b6 26.¦e6; 22...e3 23.Ґxe3 ¤xb2 24.Ґd4! 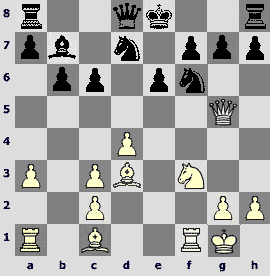 )23.¦d6 ¤d3 24.¦xe4 ¤xf4 25.¦xf6 ¤fd5 26.¦xg6, although White has great winning chances in any case. 22.Ґf3! 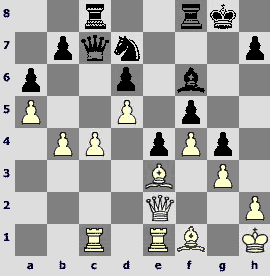 The central pawn falls, and Black is left with some insignificant tactical ideas. 22...¤xg3 23.hxg3 O-O-O?! Perhaps he should have tried 23...Јg5!? hoping for 24.Јxe4+ ¤e5, and White must continue 25.¦fe1! Јh6 26.ўf1, while 25.Ґe2 Јh6 26.f3 (26.f4 Јh2+ 27.ўf2 is refuted by 27...Јxg3+! !, and on 28.ўxg3? Ґh4+ and 29...Ґf2+ mates) is strongly met by 26...Јh2+ 27.ўf2 ¦h3! – the struggle goes on. 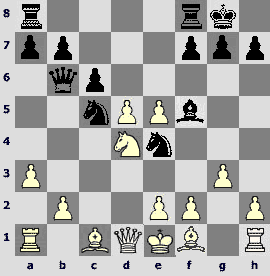 Probably simpler is 24.Ґxe4 ¤xb2 25.¦d2 Јh6 26.Ґf5+ ўf8 27.Ґh3, disillusioning the opponent. 1.e4 c6 2.d4 d5 3.f3 e6 4.¤c3 Ґb4 5.a3!? A brave idea. 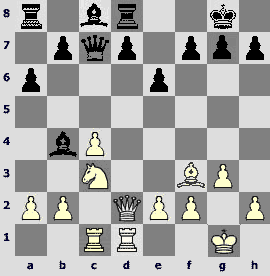 White sacrifices the central pawn for two bishops and better development. The usual move is – 5.Ґf4. 7.Јe2!N. A successful novelty! White threatens 8.fxe4, forcing the opponent to take on f3. Earlier tries 7.Ґf4 and 7.Ґc4 are less convincing. 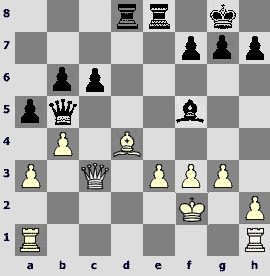 Later we`ll see that Zvjaginsev prepared an unusual queen maneuver, moving it to g5. 7...exf3. 7...c5 is an alternative. In this case was can continue with thematic 8.Ґb2! ?, or just take on e4. 8.¤xf3 ¤f6 9.Јe3! ¤bd7 10.Ґd3 b6 11.O-O Ґb7 12.Јg5!White has implemented his idea, and Black has to answer a difficult question: what shall he do with the king? 12...¦g8?! 12...0-0 seems to be the lesser of evils, although I wouldn`t like having Black in the position after 13.Јg3! c5 14.Ґg5 followed by ¤e5. White`s initiative is very strong. 13.a4! A deep move, which is always useful for creating some queenside play. Forinstance, 13...Јe7 14.a5±. 13...c5 14.¤e5 h6 15.Јg3. Black`s position is objectively hard, and it is almost impossible to defend it against a strong grandmaster. 15...¤xe5 16.dxe5 ¤d7?! Accelerating the events. Black`s last chance consists in 16...¤e4!? 17.Јf3 (also interesting is 17.Јf4! ?, provoking 17...f5) 17...¤d6. Now 18.Јh5 ¤f5 19.Ґb5+ (19.Ґxf5 g6!) 19...ўf8 20.¦d1 Јh4 is ineffective, but 18.Ґb5+ ўf8 19.Ґc6! 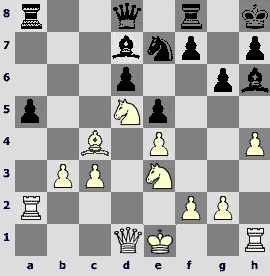 (neutralizing the opponent`s best piece) 19...Ґxc6 20.Јxc6 ¤f5 (20...¤e8 21.a5!±)21.g4! ¤h4 (21...¤e7 22.Јxe6 Јe8 23.a5!±) 22.Јb7! Јe8 23.a5! 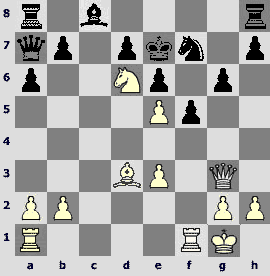 gives White strong initiative after 23...¦d8 24.axb6 ¦d7 in either 25.Јc6 axb6 26.¦a8 ¦d8 27.¦a7! g5 28.Ґe3 or 25.bxa7 ¦xb7 26.a8Ј ¦b8 27.Јa7 g5 28.Јxc5+ ўg7 29.¦a7. 18.¦xf7! A neat tactical blow in the end.18...ўxf7 loses instantly to 19.Јg6+ ўe7 20.Ґg5+. It happened so that my selection features quite a few textbook examples on the topic "Playing against the king stuck in the center". 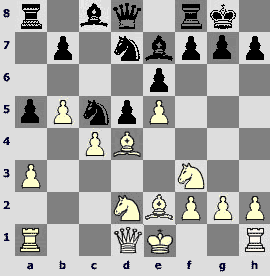 Alexandra Kosteniuk`s opponent voluntarily took the risk, but was unable to stop White`s offensive. 1.e4 c5 2.¤f3 ¤c6 3.Ґb5 g6 4.Ґxc6 dxc6 5.d3 Ґg7 6.h3 ¤h6. The knight is developed to f6 more often. 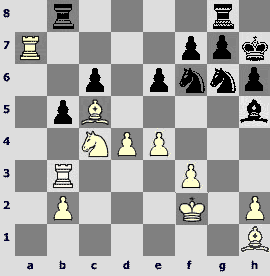 The move in the text was introduced by Ruslan Ponomariov, and Black enjoyed good results with it recently. 7.¤c3 b6 8.Ґe3 f6 9.Јd2 ¤f7 10.¤e2!?N. A new move. Alexandra keeps both castling options, and the knight will support the f2-f4 advance from e2. 10...e5 11.¤h2 f5!? An ambitious and risky decision. Probably it was better to delay opening the center, although intuitively Black seems to be doing everything correctly. 13.f4! Sacrifice of the b2-pawn is almost forced, as Black threatened 13...f4. 13...exf4. Black accepts the challenge. 13...e4!? 14.dxe4 Јxd2+ 15.Ґxd2 Ґxb2 16.¦b1 Ґg7 17.e5 Ґe6 with complex endgame deserved attention. 14.¤xf4 Ґxb2 15.¦b1 Јf6?! Odd arrangement of pieces eventually led to a disaster. Harmonious 15...Ґg7 16.0-0 0-0 17.¤h5 gives White compensation for a pawn, but it is better for Black compared to the game. 16.O-O Ґd7? This is a decisive error. One had to use the last opportunity to remove the king from the center: 16...0-0 17.¤f3 Ґd7 18.¤h5 Јc3 19.Јf2 – White has the initiative, but not more. 18.¦xb2! Јxb2 19.Ґg5! White did not miss her chance, and now Black`s position is completely lost. 19...¤xg5 20.Јxg5 Јd4+ 21.ўh1 ўf7 22.¤g4! h6. The only move preventing 23.¤h6+. 23.¤xh6+?! A slight inaccuracy that allowed Black extending the struggle. Energetic 23.¦xf5+ Ґxf5 24.Јxf5+ ўe7 (or 24...ўe8) 25.¤e5! decided on a spot. 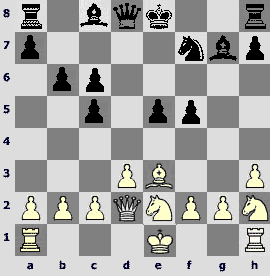 Black heavy pieces are helpless against queen and two knights. Such pieces are deadly when attacking the king. 23...¦xh6 24.Јxh6 ¦h8. White has an advantage, of course, but he is no longer mating. 25.Јg5 ¦g8 26.Јd2 c4?! This overoptimistic move only creates a new weakness, better is reserved 26...Ґe6. 27.¦f4 c3. 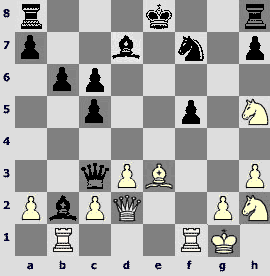 Black rejects 27...Јa1+ 28.ўh2 cxd3 29.Јxd3 Ґe6 due to 30.Јd6±. 28.Јe1 Јd6?! If 28...Јd5, then 29.¤g3 c5 30.a3±. 29.Јf2. The computer confidently proves White`s advantage after 29.Јxc3! Јg6 30.g4!, but human beings do not weaken their king without reason. 29...Јg6 30.¦d4 Ґe6 31.¤f4 Јg3 32.Јe2 Ґd5? Cracking under the pressure. After 32...Ґc8 White has no direct win. 33.¤xd5 cxd5 34.¦xd5 ўf6 35.¦d4 ¦g7 36.¦d8 ¦g8 37.¦d5 Јf4 38.Јe1! ўg5 39.Јe7+ ўh6. 40.Јf6+ ¦g6 41.Јh8+ ўg5 42.¦d4ќ wins quickly. Artyom Timofeev created problems for his opponent in a hot line of the Sveshnikov Variation, and it resulted in a quick and confident victory. 1.e4 c5 2.¤f3 ¤c6 3.d4 cxd4 4.¤xd4 ¤f6 5.¤c3 e5 6.¤db5 d6 7.Ґg5 a6 8.¤a3 b5 9.¤d5 Ґe7 10.Ґxf6 Ґxf6 11.c3 Ґg5 12.¤c2 O-O 13.a4 bxa4 14.¦xa4 a5 15.Ґc4 Ґd7. An old recommendation of Portisch, successfully tried by Teimour Radjabov against strong opposition. Here is a couple of recent examples: 16.0-0 ¤e7 (16...¤b4 17.¦a3 ¦c8 18.cxb4 axb4 19.¦a6 ¦xc4 20.¦xd6 b3 21.¤ce3 ¦d4 22.Јxb3 Јc8© Volokitin-Radjabov, Biel 2006) 17.¦a2 ¦c8 18.¤xe7+ Јxe7 19.Ґd5 ¦c5 20.b3 ¦xc3 21.¦xa5 Ґe6= Anand-Radjabov (Mainz 2006). Usual move is 15...¦b8. 16.¤ce3 g6 17.b3!?N. An improvement over 17.0-0. Artyom plans to use the king`s rook on the h-file. However, a deep and meticulous analysis is required to reveal a true value of this innovation. In the game Black ended up in a difficult position too quickly. 17...ўh8 18.h4! Ґh6?! Pavel did not take on h4, and it seems he was wrong. In case of 18...Ґxh4 19.¤f5!? gxf5 20.Јh5 Black can reject 20...Јg5 21.¦xh4 Јc1+ 22.Јd1 Јxd1+ 23.ўxd1 with inferior ending, in favor of 20...fxe4! 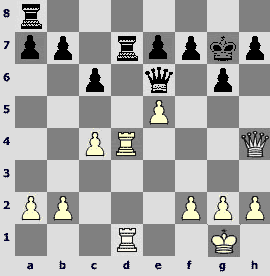 21.¦xh4 Ґf5, brining the bishop to the defense. 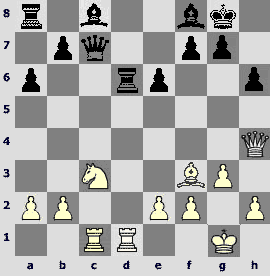 However, White`s 19th move is by no means forced. 20.¤f6! Probably missed by Black. 20...Ґe6. If 20...Ґxe3 21.fxe3 (there is even 21.Јxd6!?) 21...Ґe6, then 22.h5!, and now 22...¤g8 23.¤xh7! ўxh7 24.hxg6+ with decisive attack. 21.h5 Ґxc4?! Creating additional problems with the d6-pawn. More tenacious is 21...¤g8. 22.¤xc4 Ґg5? Loses instantly, but 22...ўg7 23.¤g4 Ґg5 24.Јxd6 is also far from being acceptable for Black. The next game is important for the theory of the Nimzo-Indian. Alexander Motylev`s idea is interesting, although not undisputable. And, in any case, the game is very attractive. 1.d4 ¤f6 2.c4 e6 3.¤c3 Ґb4 4.Јc2 d5 5.a3 Ґxc3+ 6.Јxc3 ¤e4 7.Јc2 e5!? Michael Adams advocates this active continuation. 8...Ґf5!?N. 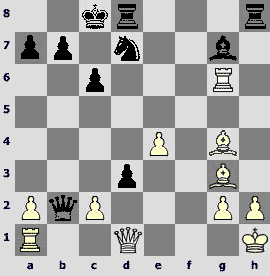 Black rejected a usual 8...Јxd5 9.f3 ¤d6 10.dxe5 Јxe5 11.e4 ¤c6 12.¤e2! 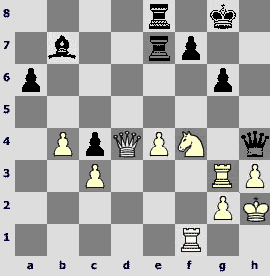 Ґe6 13.Ґf4І (Kasparov-Adams, Linares 2005), and offers a couple of pawns for the initiative. Objective value of the novelty is unknown, but playing against Motylev`s preparation was difficult for Vyacheslav Zakhartsov. 9.Јa4+ ¤d7 10.¤f3. 10.g4!? deserves attention, winning tempi for development. The game may continue 10...Ґxg4 11.dxe5; or 10...Ґg6 11.dxe5 0-0 12.¤f3; or 10...Јh4 11.Ґe3 Јxg4 12.Ґh3 Јh5 13.dxe5 0-0 14.Ґxf5 Јxf5 15.f3 ¤ec5 16.Јf4. In all these lines Black has yet to show his compensation. 10...O-O 11.dxe5 c6. Another direction is 11...¤b6 12.Јb3 ¤xd5. 12.g3?! 12.d6 ismoreprincipled. If Black plays by analogy with the game, White has a chance to seize the initiative, e.g., 12...¤dc5 13.Јd1 Јb6 14.b4 ¤d3+ 15.Јxd3 Јxf2+ 16.ўd1 ¤g3 17.Ґe3! ¤xh1 18.Јd4 Јxf1+ 19.ўd2 Јxg2 20.¦g1 Јh3 21.e6 f6 22.e7. 12...¤dc5 13.Јd1 Јb6 14.¤d4. Now after 14.b4? ¤d3+ 15.Јxd3 Јxf2+ 16.ўd1 ¤xg3 17.Ґe3 ¤xh1 18.Јd4 Јxf1+ 19.ўd2 Black has 19...Јh3. An interesting position arises in case of 14.Ґe3!? Јxb2 15.Јd4 ¤c3 16.¦c1 ¤5e4©. 14...¦ad8! 15.d6. 15.¤xf5?! is very risky because of 15...¤d3+ 16.Јxd3 Јxf2+ 17.ўd1 Јxf5 or 15...¤b3!? White faces serious problems after 15.b4?! ¦xd5! 16.Ґe3 (16.bxc5? Јxc5°) 16...¤e6 17.¤xe6 ¦xd1+ 18.¦xd1 Јa6 19.¤xf8 Јxa3. 15...¤e6 16.e3?! After 16.Ґe3 Јa5+ 17.b4 Јxe5 18.f4 Јd5 19.¤xf5 Јxf5 20.Ґg2 ¤xd6 21.Јb1 both sides have chances. Now Black`s threats begin to grow. 16...Јa5+ 17.b4 Јxe5 18.Ґb2 ¤xd6 19.Ґe2 ¤b5! 20.Ґxb5. In order to preserve material balance White has to part with his light-squared bishop. 20...¤xd4 21.Ґxd4 Јxb5 22.f3 ¦fe8 23.ўf2 a5 24.Јd2 b6 25.Јc3? Possibly a decisive error, White had to play 25.Јb2. 25...c5! Alexander correctly assessed consequences of the coming exchange of queens. 26.bxc5. Bad is 26.Ґxg7? due to 26...¦d3 27.Јd2 Јd7°. 26...bxc5 27.Јxc5 Јxc5 28.Ґxc5 ¦d2+ 29.ўe1 ¦c2. 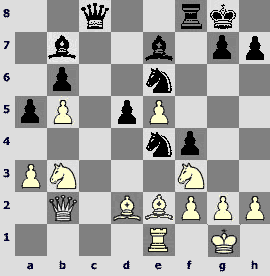 White`s pieces are not coordinated, and the presence of opposite-colored bishops adds strength to Black`s attack. 30.Ґd4 Ґh3 31.ўd1? The king stands badly here. 31.¦g1 would preserve some hopes. However, attackers do not win all the time, even if their attacks look decisive. In the next episode such a renowned attacker as Pavel Smirnov was unsuccessful. 28.e5! White`s pieces are placed ideally, everything is ready for a central break. 28...dxe5. Not better is 28...¤d5 29.Јg4. 29.fxe5 Ґd6. Black wins a central pawn, but his king loses a pawn shelter. 30.¤xg6! fxg6 31.Јc2! The point of Smirnov`s idea. 31...¤xe5 32.Ґxe5 Ґxe5 33.Јxg6+ Јg7. On 33...ўf8 (or 33...ўh8) one may first take the h6-pawn – 34.Јxh6+ ўg8 35.Јg6+ ўf8, and then add a deadly 36.¦d6! 34.¦xc6. White has a material advantage. 34...¦bc8 35.Јxg7+ ўxg7 36.¤f5+ ўf8 37.¦b6 ¦b8 38.¦xb8 ¦xb8 39.¤xh6 Ґxb2 40.g4. Objectively White must be winning, but Pavel did not manage to convert his bright idea into a full point – the game ended in a draw. We are now approaching one of the most exciting and thrilling games. To be honest, I had little time to find all ins and out in this battle. Objective evaluations will come in due time, and for now I can just say that strong opening novelty of Alexander Galkin did not confuse Tomsk resident Andrey Belozerov, who conducted a brilliant sacrificial attack, showed his imagination and pleased the home crowd. 1.e4 c6 2.d4 d5 3.¤c3 dxe4 4.¤xe4 ¤d7 5.¤g5 ¤gf6 6.Ґd3 e6 7.¤1f3 Ґd6 8.Јe2 h6 9.¤e4 ¤xe4 10.Јxe4 Јc7 11.O-Ob6 12.Јg4 ўf8 13.b3 Ґb7 14.Ґb2 ¤f6 15.Јh4 ¤d5!? 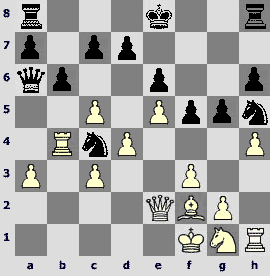 The main discussion goes around 15...c5 16.dxc5 Јxc5, and Black has certain problems there. Alexander Galkin already tested 15...¤d5. 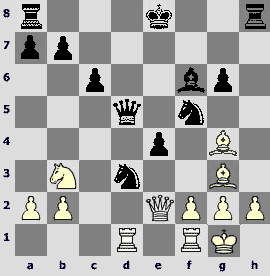 The knight goes to f4 where it restricts the White`s queen. 16.¦fe1 ¤f4 17.¦ad1 f6!N. Arakhamia-Portisch (Rokebrun 1998) continued 17...ўg8 18.c4? g5, and White has to give up a piece. However, simpler is 18.¤e5 with advantage, therefore Galkin prepares g7-g5 in a different way. Subsequent wild complications are imminent. 18.¤e5! From practical point of view this decision is completely justified, despite Black having rich defensive resources. 18...g5 19.Јg4 fxe5. Black accepts the challenge. Intermediate 19...h5 is a good alternative. 20.dxe5 Ґb4. The position is so complex that a high-quality analysis will consume too much time, so sometimes I`ll ask for the help of intuition. I feel that the bishop is more useful in defense; therefore I suggest 20...Ґe7! 21.¦e4 c5 22.¦xf4+! gxf4 23.Ґg6. White sacrificed a whole rook (we are not counting pawns) and increases the pressure quite slowly. A primitive 23.Јxe6 Јe7 24.Јg6 also deserved attention. 23...Јe7 24.h4 h5. Here 27...f3!? is interesting, planning to weaken the White king. 25.Јxf4+ ўg7 26.Ґxh5. On 26.Јg3 Black replies 26...¦hg8. 26...¦h7. Bad is 26...¦xh5? 27.Јg4+, and if 27...ўh6?, then 28.Ґc1+. 27.a3 ўh8?! We are approaching a culmination of this head-spinning encounter. Black probably underestimated the queen exchange on the 29th move. After 27...Ґa5! 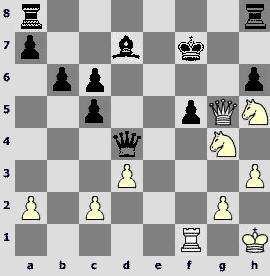 28.Јf6+ ўg8 29.Ґg6 ¦g7 finding new attacking resources becomes difficult for White. 28.Ґg6! A very beautiful and strong decision. The point is that after the exchange on f6, the bishop on b2 becomes very powerful, and White develops a terrible attack with limited material. 28...¦xh4? A decisive mistake. On 28...Јxh4? White plays 29.Јf6+ Јxf6 30.exf6 Ґxa3 31.Ґe5!ќ, by analogy with the game. It is stunning, but on 28...¦f8?! White nevertheless plays 29.Јf6+!! ¦xf6 (relatively better is 29...¦g7 30.Јxe7 ¦xe7 31.axb4 cxb4 with bad ending) 30.exf6 Јf8 31.f7+ ¦g7 32.axb4ќ – here Black, despite having an extra queen, are helpless against the h-pawn advance. The best reply is 28...Ґxa3!, and then 29.Ґxa3 Јxh4 (or 29...¦xh4 30.Јg3 ¦g8 31.¦d7! ¦d8!! 32.¦d6 ¦g8 33.¦xe6! ¦h1+! 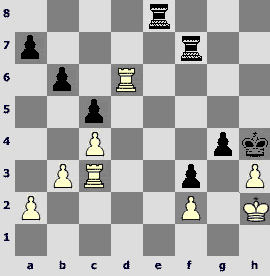 34.ўxh1 Јxe6 – Black barely holds) 30.Јf6+ Јxf6 31.exf6 ¦h6 32.¦d7 ¦xg6 33.¦xb7 sharp struggle continues in an endgame. 29.Јf6+! Јxf6 30.exf6 Ґxa3 31.Ґe5! The last finesse! 31...¦e4 32.Ґxe4 Ґxe4 33.¦d7. Black must part with a rook for the f-pawn. The rest is easy. Let us move on to strategic masterpieces. This is not an exaggeration – the participants have really created great positional games. In some of them it is not easy to find out which error of the losing player was decisive. In the following game Ernesto Inarkiev managed to stop the tournament leader. 1.d4 ¤f6 2.c4 e6 3.¤c3 Ґb4 4.¤f3 c5 5.g3 ¤c6 6.Ґg2 ¤e4 7.Ґd2 ¤xd2 8.Јxd2 cxd4 9.¤xd4 ¤e5 10.¤f3 ¤xf3+ 11.Ґxf3 O-O 12.¦c1!?N. 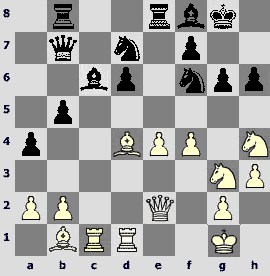 In Moiseenko-Pyrligras (Warsaw 2005) White had a minimal pressure after 12.0-0 ¦b8 13.a3 Ґxc3 14.Јxc3 b6 15.¦fd1 Ґb7 16.¦d4І. The new idea is to take on c3 with the rook, and then place it to d3. 12...a6 13.O-O Јc7 14.¦fd1 ¦d8. From now on Inarkiev demonstrates a very original way of solving positional problems. 15.Јg5!? 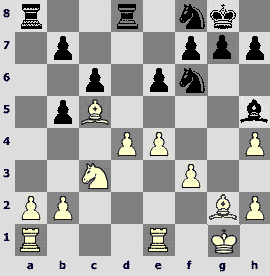 White will have all time in the world for playing schematic 15.a3. 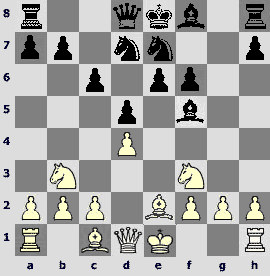 The queen aims at the d8-rook, creating tactical motif for c4-c5 advance. 15...h6 16.Јh4 Ґf8 17.c5! 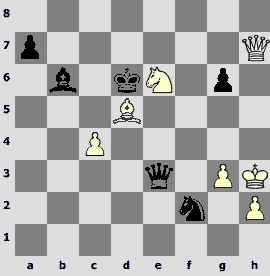 Black`s difficulties with developing the queenside increase. 19.¤d5! In is not a banal tactical punch – Ernesto improves his knight, which should stand on c4. 19...Јd7 20.¤e3! ¦b8 21.¦xd6 Јxd6 22.¦d1 Јe7 23.¤c4!? A very unorthodox decision! 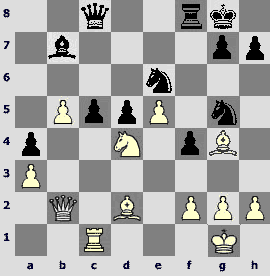 White accepts ruining his kingside pawns, although he could prevent it by 23.Јd4. 23...g5?! Black cracks under positional pressure. He should have sought salvation in the endgames with opposite-colored bishops after 23...Јxh4 24.gxh4 Ґe7 25.¤b6 e5, and then 26.¤xc8 or 26.¤d7. 24.Јd4 b5? A fatal error. In case of 24...Јc7 25.Ґh5 the f7-square becomes an Achilles` heel. Only 24...e5! ?, activating the light-squared bishop, keeps some saving chances. 25.Јe5 ¦b7. One has to give up an exchange, as 25...Јa7 is met by 26.¦d8ќ. 26.Ґxb7 Ґxb7 27.Јd6 Јf6. Naturally, 27...bxc4 will be met by 28.Јxe7 Ґxe7 29.¦d7. 28.Јb8 Ґd5 29.¤e5. After 29.¤b6! Јxb2 30.¤d7 Јa3 31.e4! Ґxe4 32.¤xf8 Јxf8 33.¦d8 the game ends up quicker. Denis Khismatullin retaliated in the next round, having defeated Petersburger Evgeny Alekseev, although he had to offer a pawn to seize the initiative. 1.e4 c5 2.¤e2 ¤c6 3.¤bc3 e6 4.d4 cxd4 5.¤xd4 a6 6.g3 d6 7.Ґg2 Ґd7 8.O-O ¤f6 9.a4 Ґe7 10.¤b3 ¤a5 11.¤xa5 Јxa5 12.Ґd2 Јc7 13.a5 Ґc6 14.¦e1 O-O 15.Ґf4N. We are arrived at not very popular branch of the Scheveningen. Older moves are 15.¤a4 and 15.g4. 17.¤d5!? Black has nothing to worry about if the game continues quietly. Denis does not agree to continue "quietly", and makes the position resembling a Najdorf, sacrificing a pawn in a way. 17...Ґxd5. Of course, bad is 17...exd5? 18.exd5. 18.exd5 e5 19.Ґd2!? In case of 19.c3 exf4 20.Јxe7 ¤e5 (it is stronger than 20...fxg3?! 21.hxg3 ¤e5 22.Јxc7 ¦xc7 23.f4 ¤d3 24.¦e2 with advantage) 21.Јxc7 ¦xc7 22.gxf4 ¤d3 Black is close to equality. 19...f5. An important moment. Maybe Black should have made up his mind about 19...Јxc2!? White seizes the c-file, which promises him sufficient compensation, but the lines like 20.Ґh3 Јc7 21.¦ac1 Јd8 22.¦xc8 Јxc8 23.¦c1 Јd8 (planning f7-f5, Ґe7-g5) or 20...¦cd8 21.¦ec1 Јb3 22.¦c7 f5 can hardly scare Black. 20.¦ac1. White has a clear plan of advancing the queenside pawns, opening the position and utilizing the potential of his heavy pieces and bishop pair. Blackmustseekcounterplay. 20...Ґf6?! Evgeny hesitates for a few moves, which eventually leads him to a strategically difficult (if not hopeless) situation. It was time for 20...e4! vacating the e5-square for the knight. 21.Ґh3! Ґe7. It turns out that 21...g6 is unpleasantly met by 22.g4! 22.ўh1 ¦ce8?! Black unsuccessfully weakens his control over the c5-square. However, at some point it becomes difficult to suggest Black any improvement – White`s initiative develops as if by itself. Maybe 22...b5!? deserves consideration. 23.f3 Ґd8 24.b4 e4 25.f4. The d7-knight has no prospective now. 25...g5 26.c4! White doesn`t have to take the g5-pawn. Now the f5-pawn becomes very weak. 26...g4 27.Ґf1 Ґf6. The c4-c5 break is imminent. 27...b6 does not help: 28.axb6 ¤xb6 29.c5! dxc5 30.d6! 29.c5! Black`s position is hopeless. 29...dxc5. Otherwise White pushes 30.c6. 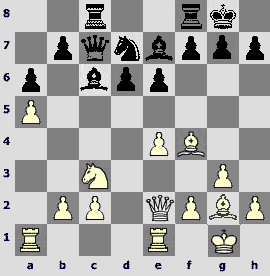 30.bxc5 Јxa5 31.c6 bxc6 32.dxc6 ¤b8 33.Јc4+ ¦f7 34.Јe6 ¦xc6 35.Јb3! Khismatullin spectacularly ends the game, obtaining an easily won position with an extra exchange. Efficient win of Konstantin Landa in one of his pet lines made a strong impression. 1.¤f3 d5 2.d4 ¤f6 3.c4 c6 4.Јc2 dxc4 5.Јxc4 Ґf5 6.g3 e6 7.Ґg2 ¤bd7 8.¤c3 Ґe7 9.O-O O-O 10.¦e1 ¤e4 11.Јb3 Јb6 12.¤h4! This idea already occurred in Konstantin`s games. One has the right to spoil one`s own pawn structure, obtaining powerful pawn center and grip on dark squares in return. White has no other options if he is interested in opening advantage. 12...Ґxh4 13.gxh4 ¤ef6 14.Јxb6 axb6 15.Ґf4 b5 16.Ґd6 ¦fd8. In case of 16...¦fc8 one has to take 17.¤xb5!? 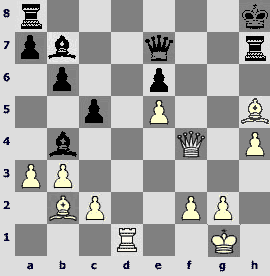 into account: 17...cxb5 18.Ґxb7, as in Khenkin-M.Gurevich (Hoogeven 2004). 17.e4!N. In Urban-Jaracz (Warsaw 2003) Black did not experience any problems after 17.a4 bxa4 18.¤xa4 ¤f8 19.Ґe5 ¤g4, and the game soon ended in a draw. 17...Ґg6 18.f3 ¤f8. Black tries playing against kingside weaknesses, and even captures the h4-pawn, but White dominates on the opposite wing, and has superior chances due to the stronger center. 19.Ґc5 Ґh5. If 19...¤8d7, then 20.Ґe7 ¦e8 21.Ґd6. 20.a4! Clearing the path for the knight, which strives to b6, and in addition opening the a-file. 20...bxa4 21.¤xa4 ¤g6 22.¤b6 ¦ab8. If Black starts with 22...¦xa1 23.¦xa1 and then plays 23...¤xh4, after 24.ўf2 he is helpless against the rook`s invasion to a7. 23...¤xh4? This is almost the only definite mistake of Black in the game. White smoothly conducts his plan with the knight on b6. It had to be exchanged by 23...¤d7 24.¤xd7 ¦xd7, taking the h4-pawn later, although White`s compensation in this case in also doubtless. 24.¦b3 h6. 24...¤xg2 25.ўxg2 ¤d7? fails to 26.Ґe7. 29.¤e5! After the d-file opens, the second rook invades inevitably. 29...¤xe5 30.dxe5 ¤e8 31.¦d3 g5 32.b4 Ґg6 33.Ґg2 ¤g7 34.¦d6 ¦gc8 35.Ґf1 ¤h5. A late activity attempt. 36.¦xe6 ¤f4 37.¦ee7 ¦a8 38.ўe3 ¤e6?! 38...¦a8 extends the resistance, but is unlikely to alter the outcome. 39.Ґh3 ¦xa7 40.Ґxa7 ¦c7 41.¦xc7 ¤xc7 42.Ґd7 ¤a6 43.Ґxc6 ¤xb4 44.Ґxb5. The knight is trapped. In the next encounter Alexey Dreev made an opening improvement, but the game was decided by Dmitry Bocharov`s blunder in the middlegame. 13.Јc2!N. At the previous Higher League Bareev-Bocharov continued 13.a4 ¤b6?! 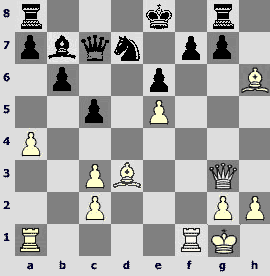 14.Јc2!± (Kazan 2005), but 13...b6 or 13...f6 would give Black a good game. Dreev demonstrates an improvement. 13...b6 14.cxd5 exd5 15.O-O Ґb7 16.¦fe1 ¦c8 17.Јb2 ¤e6 18.Ґe3. 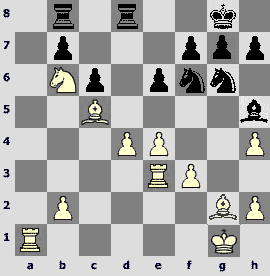 White enjoys a small space advantage, but Black`s position is solid. The d5-pawn is isolated, but its White counterpart on e5 is weak, too. 18...¤dc5. An alternative is simplifying 18...Ґc5!? 19.¦ac1 f5!? Black fights for the initiative, but he could also play 19...Јd7. 23.¤fd4!? This pawn sacrifice is dubious. 23...a4? In case of 23...¤xd4 24.¤xd4 ¤xd2 25.Јxd2 Ґxa3 White relies on the passed e-pawn: 26.¤c6 Ґxc6 27.dxc6 Јxc6 28.Ґf3 ўh8 29.Ґxd5 ¦d8›. Dmitry does not dare going into such turmoil, and immediately blunders, which costs him the game. 24.Ґg4! ¤4g5 25.¦c1 Ґc5. 25...Јd7? is mistaken because of 26.¤xe6 ¤xe6 27.¤d4. 27.Ґb4! White wins a pawn, and demonstrates precision during the technical stage. Young St.Petersburg resident Pavel Anisimov forced the enemy king walking into the center of the board immediately after the opening stage. 1.e4 c5 2.¤f3 e6 3.d4 cxd4 4.¤xd4 a6 5.Ґd3 Јb6 6.c3 ¤c6 7.Ґe3 Ґc5?! Black`s problem in this game started with choosing a variation almost refuted by the theory. 7...Јc7 is safer. 8.¤d2! ¤xd4 9.¤c4 Јa7 10.cxd4 Ґxd4 11.e5! Ґxe3 12.fxe3 ¤h6 13.¤d6+ ўe7 14.Јf3 f5N. Preceding game L.Milov-Osterwald (Diren 1997) ended fairly quickly: 14...¦f8 15.Јg3 Јc5 16.O-O ¤g4 17.Јh4+ f6 18.Јxg4 Јxe3+ 19.ўh1 1-0. 15.Јg3 ¤f7 16.O-O g6. Nothing is changed by 16...¤xd6 17.exd6+ ўf6 18.Јh4+ g5 19.Јh6+ќ. Black`s position is absolutely hopeless, and a neat finale follows. 17.Ґxf5! exf5. If 17...gxf5, then 18.Јh4+ ўf8 19.Јf6. 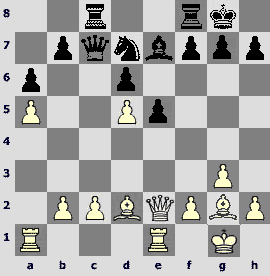 18.¦xf5!gxf5 19.Јh4+ ўe6 20.Јf6+ ўd5 21.Јxf7+ўxe5. 21...ўc6 22.¦c1+ Јc5 (22...ўb6 23.Јb3+) 23.¦xc5+ ўxc5 24.Јg7 ¦d8 25.Јe7ќ. Let us examine a few more spectacular tactical shots. Usually they appeared against the background of blunders, but they`re still very attractive. 41.ўh4?? 41.ўg2 ¤g4 42.ўh3 ¤f2+ leads to a draw. 20...Јxc4! A cross-pin rare in practical play allows Black winning a pawn. 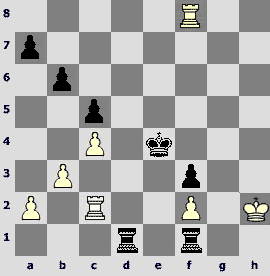 21.e6 ¦xd4 22.Јxd4+ Јxd4 23.¦xd4 ўf6 24.exf7 ўxf7, and Black utilized his material advantage in the endgame. 17...¤e3+! 18.ўe1 ¤xg2+. 18...Јxe2+! is more accurate, forcing 19.ўxe2 (19.¤xe2? ¤c2+) 19...¤xg2. 19.ўd2 Јxe2+. Here 19...Јxa3! is attractive. 20.¤xe2 ўf7. Black won a pawn, but White managed to save a difficult ending. 44.¤xg6! A shortest way to a win. 44...fxg6 45.¦xg6+ ўh7 46.¦g4! Coordinating the heavy piece with tempo and creating irresistible threats. 39.hxg4? After 39.¦g6 this game would hardly end in favor of either side, but now White is lost. 39...¦e2! 40.ўg1 ¦e1+ 41.ўh2 ¦f1 42.¦c2. Also hopeless is 42.¦h6+ ўg5 43.¦h8 ¦xf2+ 44.ўg1 ¦xa2°. 42...ўxg4. Threatening mate from h7. 43.¦h6. 43.¦xg6+ ўf4 changes nothing. 43...¦d7 44.¦h8. Waiting 44.¦b2 is met by 44...¦dd1 45.¦g6+ ўf5 46.¦c6 (where else?) 46...¦g1! with inevitable mate. The game ends with the rook being entrapped in the most elegant and unexpected way.